The Queensferry Crossing is due to open mid-July – end August 2017. This forms the centrepiece of a major upgrade to the cross-Forth transport corridor in the east of Scotland, representing a total Scottish Government investment of £1.325 to £1.35 billion, releasing £245 million worth of savings since construction started in June 2011. 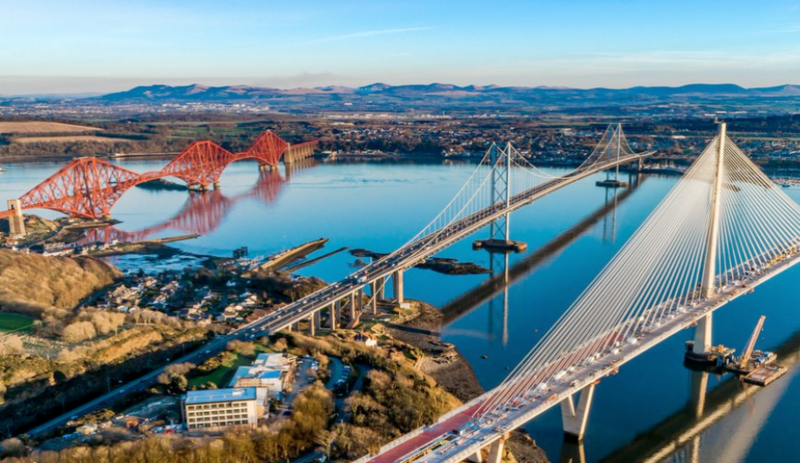 In total, the bridge and approach roads come to 13.7 miles (22km) long, including major motorway upgrades to the north and south of the bridge and also the first ever use in Scotland of variable mandatory speed limits to smooth traffic congestion via an Intelligent Transport System. This also controls dedicated bus lanes within the motorway hard shoulders – another first in Scotland. When the new crossing opens, the Forth Road Bridge will become dedicated for public transport use, cycling and walking.